The idea of using sound as a kind of sight goes back a long way, from sonar to that nifty smartphone sonar surveillance in The Dark Knight. Now, the idea is intersecting with wearable tech in the form of BuzzClip, a tool which provides a kind of ultrasonic sight to the blind. 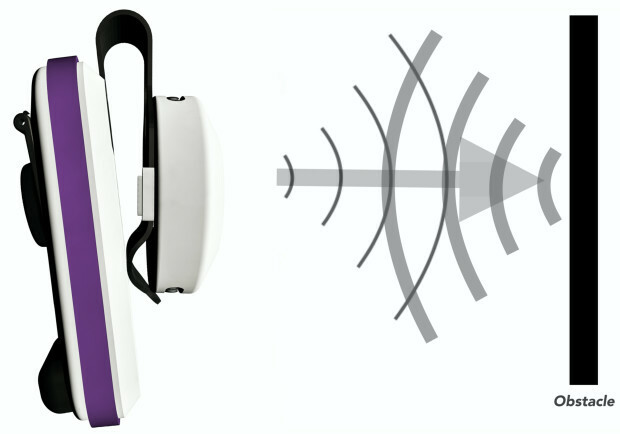 Currently in an Indiegogo campaign, BuzzClip uses ultrasound to detect obstacles in a user's path. Then, once said obstacles are detected, the clip emits a series of pulses designed to warn the user that there's something detected in the way. Since it's a clip, it attaches readily to most kinds of clothing, from sleeves to collars to pockets. It can work at either roughly three or six foot ranges, and the vibration pulses grow more rapid as the user approaches the object. Should the user get within just over a foot from the object, the device gives three sharp pulses to help notify the user to stop and clear the path ahead. Better yet, the device can even warn the user about the need to recharge via pulses, providing a specific vibration to let the user know the battery level. The battery lasts for 10 hours under what's called “rigorous use”, and charges via microUSB cable. Users can even use several BuzzClips in tandem to provide better information about what's coming at specific levels; one higher up identifies head-height hazards, while one around the belt level spots waist-high issues. Those interested in getting a BuzzClip can still do so at Early Bird pricing, which is $129 per unit plus shipping. That only lasts through the first 100, but since only 45 have been claimed as of this writing, there's a good chance to get in. It comes with cord lanyard, microUSB charger and cable to keep it all afloat. It might seem like this is a little too close a proximity warning to be really useful, but the idea makes some sense. If it worked in a wider radius, it would be harder to tell just what was potentially in the way. This is more of a last-ditch proximity warning, and given its target market, that's probably for the best. Dogs and canes generally don't do well with tree branches or wires, and that's where the BuzzClip can really shine, providing that last-second, close-range detection needed to spot higher-altitude issues. The BuzzClip represents a fairly exciting idea, and should prove valuable for those of various levels of sight who need just a little extra warning detection.